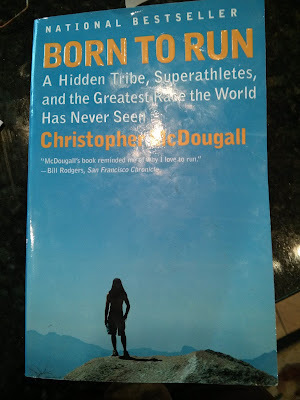 Pinterest A Grateful Life Lived: Book Review: "Born to Run"
Book Review: "Born to Run"
As a runner, I was intensely curious when I unwrapped the gift of Born to Run at Christmastime last year. However, as a high school student, I was strapped for time and unable to even start the book until vacation that next summer. I read the first chapter, loved it, and then completely forgot the book when the pressures of a privileged teenage life overtook me again. I was so excited then, when I was cleaning my room last month and found the book under loads of laundry on my bed. That very night, I cracked it open and began right where I'd left off. RELATED: Book Review of "Unbroken" by Laura Hillenbrand. A must read for runners! Born to Run is a runner's book-- no doubt-- but it is also an adventurer's book, a book for the traveler, or the explorer. 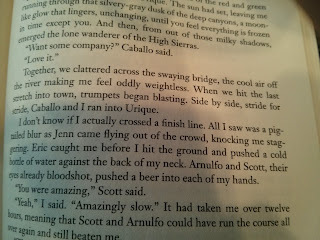 The novel focuses on a simple yet complex task of the narrator himself: to find the Tarahumara Mexican tribe and discover more about the world of ultrarunning. Ultrarunning is more than just marathon distances run on trails. Rather, it is the crazy sport of crazy people who run and run and run. Sure, they might run 26.2 miles, but they ultrarunners more than likely will be doing runs of 50, 100, or even 150 miles, out in the wild back-country. I've always loved trail running, but this "crazy" sport of ultramarathon running is now a yearning of mine after reading Born to Run, and I'll tell you why. shows how captivating the book is. Author and narrator, Christopher McDougall, sets out into Copper Canyon in Mexico, to find the illusive Tarahumara superhuman runners. They are legendary for their stint appearances in such races at the Leadville 100. As the book relays, a wilderness photographer named Rick Fisher began to speculate to the Tarahumara's greatness, and began running some of the men in the Leadville 100 in exchange for food payment. After a short while, he began trying to make a profit of the Tarahumara runners and they again retreated into their canyon, but not before Micah True paced one of them in the Leadville race and was enthralled by their raw love of running. Micah True then disapeared off the grid. He was completely accepted my the Tarahumara, out of respect for the way he helped one of their people. He became "Caballo Blanco," and he was the one that McDougall truly wanted to find when he ventured through drug dealer's turf to get to Copper Canyon. 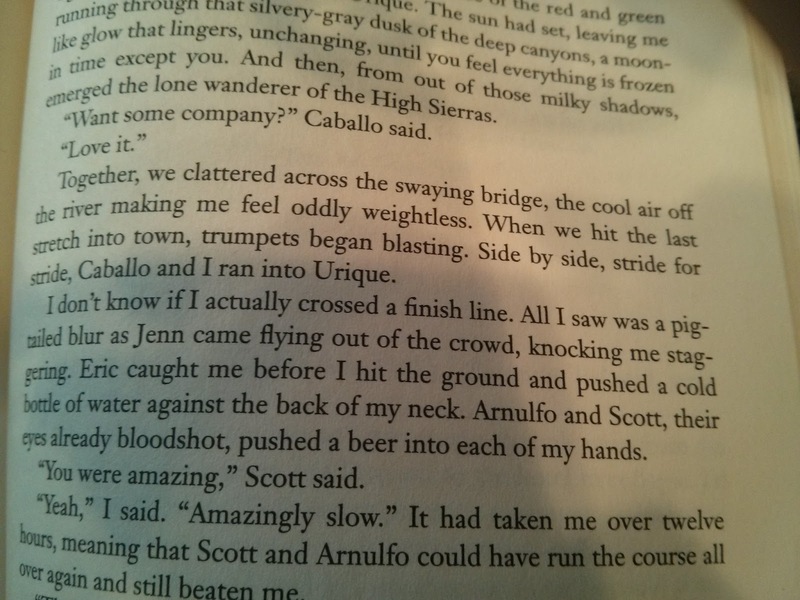 When the two finally met up, Caballo Blanco told McDougal of the wild idea he had to run a race-- a real distance race-- on the Tarahumara's home ground. What follows, is a captivating and exciting story of how that race actually came to be. It weaves through the history of trail running and recounts the great inspiration that has driven mankind to run for centuries. I thoroughly enjoyed this refreshing and inspirational story. Once I started reading again, I read the entire thing-- sans the first chapter-- in a mere three night's reading. Aside from some foul language and an evolutionary standpoint-- which I just ignored and saw the amazing design God has created in us that allows running-- I can't say a bad thing about the book. For the Tarahumara, running is such an intrinsic part of life that they run everywhere just for the joy of it. They love to compete, but they also just plain love running. All aspects of the book fascinated me, and I would highly recommend it! I found myself constantly trying to read "just one more page" and staying up to late, in order to discover the world of the Tarahumara runners and the freedom of truly running with joy. "That was the real secret of the Tarahumara: they'd never forgotten what it felt like to love running. They remembered that running was mankind's first fine art, our original act of inspired creation." If you are in need of a recollection on why you run, I encourage to you pick up Born to Run and then just try to put it down. If not for a sudden urge to run, you may be pouring over the pages until you have explored the world of ultrarunning cover to cover. RELATED: A Book Review: "Practicing His Presence"
I need to get that one! I read the preview on my Nook, but haven't actually bought it yet. With that recommendation though: I will definitely get to reading it ASAP! Thanks!